The world wouldn’t be where it is today without coal. But modern times are leaving it in the dust. Despite the adamant claims of President Trump, coal will not be making a comeback. Even if people wanted it to — and they don’t, for the most part — the industry is too far gone to see any kind of real recovery. But hey, that’s just the way progress works. One of Trump’s biggest promises while on the campaign trail was that he’d be bringing more jobs back to American businesses, with special consideration given to the floundering coal industry. What he seems not to realize, however, is that many of the jobs he’s talking about either won’t be around for much longer or are already gone. And it’s not because all our jobs have moved overseas, either. We’re simply facing another industrial revolution that will, much like the first one, put a lot of people out of work. In the 1760s, coal and steam power put machines, rather than humans, at the forefront of industry. Today, we’re so used to machines doing things for us that we hardly notice it anymore. But here’s the thing: We’re seeing machines doing things not just for us, but entirely without us. Autonomy, the use of data to create artificial intelligence in computers, is the next step up in today’s information-driven world. It’s already happening: your phone can memorize patterns in your schedule, your car can very nearly drive itself, and, if you’ve got an Amazon Echo or a Google Home Assistant, you can change the temperature, play your favorite music, and order a pizza all without hitting a single button. It’s amazing what we’ve managed to create in the last few years alone, and we’re still just scratching the surface! So... what’s all this got to do with coal? Much like every other industry out there, automation in coal mining is taking jobs from a lot of people, including those jobs Trump seems to think could still come back. And for an industry that was pretty well doomed before this development, this may just be the final straw. 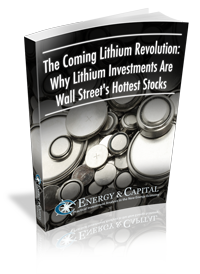 You''ll also get our free report, Investing in the Age of Clean Energy: Three Ways Every Investor can Boost their Clean Energy Portfolio by our resident expert Keith Kohl. Coal use around the world has been dropping for decades. While nominal consumption has been climbing as global energy demand grows, coal’s share of the energy market has been slipping away. Energy production from natural gas is expected to outpace coal production within the next few years. By 2040, the world could be phasing out coal entirely. China is looking to cut back on its coal use and bolster its growing renewables portfolio instead. Likewise, India's government has stated that no new coal plants will be built once those currently under construction are completed. Coal India Limited, the largest coal miner in the world, announced recently that it will be closing 37 of its mines because they’re simply too expensive to keep running. In the U.S., where our president is so sure we will be the face of the coal revival, we saw natural gas provide more energy than coal for the first time ever last year. Unfortunately for the coal industry, the Energy Information Administration doesn’t expect coal to ever take the top spot back. And just in case you were still holding out some hope, this week, it was announced that the world’s first “clean coal” plant being built by Southern Co. in Mississippi will end up running on gas instead. Turns out “clean coal” isn’t all that viable (it’s complete fiction, actually). Keep in mind that all of this is happening alongside the automation of coal mining. The industry lost as many as 50,000 jobs between 2010 and 2015, and a recent Washington Post article notes that by 2014, the entire U.S. coal industry employed fewer people than Arby’s. 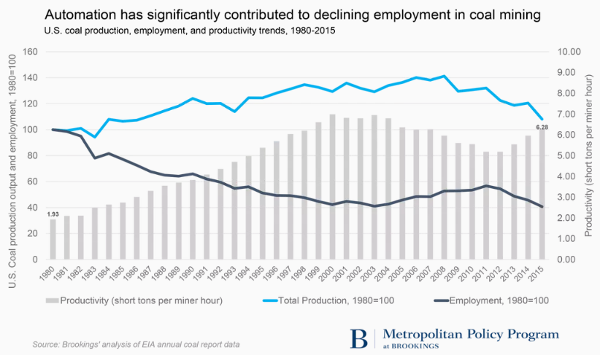 Since 1980, coal jobs have been in decline as better machinery, not higher employment, has kept production growing. Like I said, that’s just progress. Automation and AI are increasingly spreading across the workforce. I’m not saying robots are taking over the world, but I am saying they’re changing it irreparably. It’s finally time to put coal to rest for good and let newer, cleaner energy resources take the wheel. Energy and Capital editor Megan Dailey explains why Elon Musk is doing more than building electric cars; he's building the new American dream. Tesla Solar Roof Resurfaces: Is It Worth It? Last year, Tesla revealed its attractive new solar roof tiles. Now that we know more about them, could they be the thing to get the rooftop solar industry back on track?